Refrigeration tools are specialized for use in the air conditioning and refrigeration field. This page covers the manifold gauge set. Below are links to pages covering other tools used in the industry. The refrigeration and air conditioning gauge set is the most useful of all the tools in this trade except your brain. The come in a number of configurations and prices. Below we will discuss these tools and what they can do. These sets are the old standard of the industry. The red hose is mounted on the right, is then tapped to the high side side of the system. When hooked up, the gauge reads the high side pressure. The blue hose is mounted on the left, is then tapped to the low side of the system. When hooked up, the gauge reads the low side pressure. The yellow hose is mounted to the center and does not communicate with either gauge unless the valve next to the high or low side is opened. The yellow hose is called the process hose and can be hooked to either a refrigerant cylinder or a vacuum pump. When evacuating the system, the yellow hose is connected to the vacuum pump. When charging the system, the yellow hose must be removed from the vacuum pump and attached to the refrigerant cylinder. These sets are the cheapest and I have found them to last 3 to 5 years until the hoses and gauges are unusable in normal commercial use. 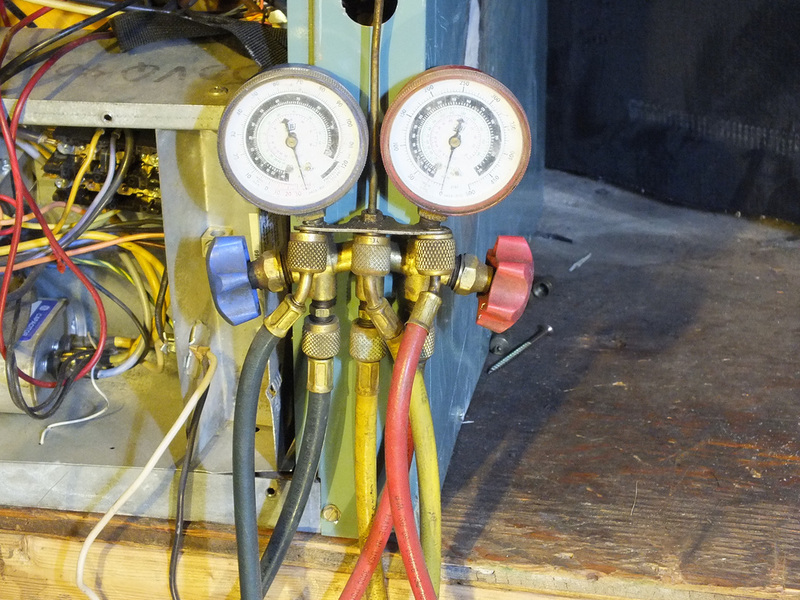 If you use this type of gauge set in the air conditioning field, you will need 2 sets. One for use with R-410A and one for use with R-22 and other lower pressure refrigerants. The reason for this is a normal low side pressure for R-22 is 70#. The normal low side pressure for R-410A is 120#. These type gauges are most accurate in the middle range of their travel. If the 70# pressure is in the center, 120# is at the upper limit of travel. If 120# is in the center, 70# is at the low part of the travel. If I was also using the set for a lower pressure refrigerant such as R-134A, it would read so low on the gauge that accuracy would be seriously degraded. The end result of this is 2 sets are necessary. The 4 valve set has added features not found on 2 valve sets. The red and blue handles accomplish the same function as the 2 valve set. The set has one more hose than the 2 valve set. This hose is 3/8" id instead of 1/4" like the other hoses. This hose is used for connection to a vacuum pump. The black handle communicates with the body of the gauge set. The yellow handle also communicates to the body of the gauge set. When the black handle is opened, and the 3/8" id hose is connected to a vacuum pump, the red and blue handles can be opened to allow the vacuum of the system. When the yellow handle is opened, and the 1/4" id yellow hose is connected to a refrigerant cylinder, the red or blue handles can be opened to allow refrigerant to pass into the system. The advantage to this set is that once the hoses are installed, the unit can be recovered, evacuated and recharged without removing the hoses. These gauge sets are approximately twice the cost of the 2 valve sets. You will also need 2 of these sets. The electronic gauge set at a reasonable price is fairly new on the market. The saturated temperature for a given pressure can be given for many refrigerants with a click of a button. You will only need one of these sets as the pressure is accurate across the scale. If you use the analog gauges you will need 2 sets. If the gauge set comes with a set of temperature probes super heat and sub cool can be read directly. These sets can take some of the calculations out of troubleshooting. Longevity and durability are not proven. Price still is fairly high. This set comes with two surface temperature probes and is capable of calculating superheat and subcool. Your basic 2 valve set is viable for use in most residential and commercial service work. With professional use, they will last 3 to 5 years. The time to replace will usually be when the hoses start leaking. One or more of the gauges may also either leak or be damaged. The 4 valve set will also last 3 to 5 years before the hoses leak. A hose set replacement may be viable due to the higher cost of the set. The 4 valve sets have the advantage of the larger diameter vacuum hose and once the set is installed, no more bleeding is necessary. With all of these, you will need a R-22 set and a R-410A set. Imperial, Robinair, J B and Yellow Jacket are all quality brands. The ability to switch saturation temperatures for all refrigerants. Temperature probes for superheat and subcool measurement. Electronic calculation of superheat and subcool. The above brands are quality tools as are Fieldpiece and Testo. Only one of these tools are necessary as the digital readouts are accurate at any normal pressure. Ultimately the choice of gauge set is a personal one. If you are unsure, I suggest the cheaper 2 valve sets until you are better able to make an informed choice. The schrader valve is simply a tire valve. It is shown on the left. 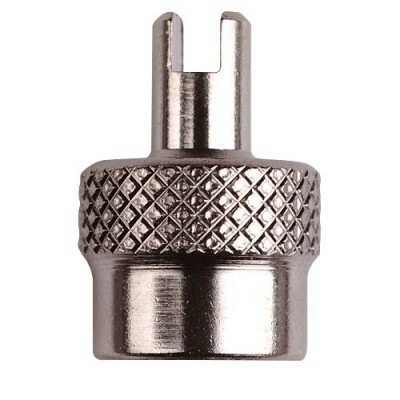 The valve is used on many air conditioning systems for adding and removing refrigerant. The simple tool on the right is a must. It comes as an attachment to a multi driver and many other styles.